Quadrotors aren’t just for Air Force personnel doing remote reconnaissance. They’re also great for airlifting pizza. And you don’t have to spend a load of cash on a ready-to-fly model — you can build a relatively simple one using some scavenged aluminum, a few electronic components from a hobby store, and open-source software. The actual hardware requirements for constructing a quadrotor are fairly minimal, since most of the magic happens in the flight controller board’s software. Keep in mind that costs increase with fancy features like GPS, built-in cameras, and the ability to lift heavy loads, but DIYers can put something together for a couple hundred dollars. The beauty of quadrotors is that they're endlessly variable depending on how they'll be used. Rather than give a specific set of instructions and lock you into one particular design, here's a rundown of your options. A basic frame consists of two rods fashioned into an ‘X’ and sandwiched between two plates, which hold the electronics, wiring, and battery. A variety of materials can be hacked into a frame for a quadrotor, as long as they’re rigid and attachable to each other: you could use carbon fiber rods, wooden dowels, and even aluminum stock from TV antennas. The most important thing is to make sure the frame is even and level. Square rods take the guesswork out of squaring up the frame and ensuring the motors are straight, making them a better choice for beginners. There’s no shame in buying a pre-made kit like this one: they can be had for ten to twenty bucks, and if your tolerance for precise measuring and cutting is limited, it may be worthwhile to buy instead of build. Pick up some spare arms or another frame or two — the first one will probably crack before you get the hang of flying. A quadrotor is about the simplest machine that can get off the ground under its own power. The four motors and props, or propellers, are the only moving parts. The props, placed at the end of each arm, generate lift. By varying their rotational speeds independently, the machine can fly, tilt, and rotate (or "yaw," if you’d like to get technical). There’s a vast array of choices for these components, depending on the desired purpose for the quadrotor. Heavier craft that need to lift large loads use larger props to generate more thrust and bigger, slower motors to drive them — but this comes at the cost of maneuverability, since the larger props have more rotational mass and have a hard time changing direction quickly. Acrobatic and miniature quadrotors need smaller props moving at high RPMs. If you’re willing to experiment, the general rule of thumb is that the motor and propeller together need to generate at least twice as much lift as the quadrotor weighs, so a five-pound aircraft needs ten pounds of thrust to be able to maneuver comfortably. Don’t forget to include the payload weight if you want to put cameras or sensors onboard! The flight controller is the brains of the quadrotor and allows the aircraft to fly. Quadrotors don't glide like an airplane: the only thing that keeps them afloat is the precise control of the motors and props. The flight controller uses accelerometers and gyroscopes to keep track of the machine’s position and correct it automatically if need be. More expensive units have additional features, like GPS positioning and waypoint navigation, which let the quad fly to a specific set of locations on “autopilot”. There’s also a premium for better software and easier configuration: while some units are designed to be nearly ready-to-fly out of the box, others require more tinkering — which may be a drawback or an asset, depending on your perspective. To vary the speed in a quadrotor’s motors, a device known as an electronic speed controller (ESC) is used. An ESC takes input from a logic board and sends varying pulses to the motor to make it spin at different rates. For the particularly adventurous, many of these are programmable and can be hacked to squeeze out better performance. ESCs are rated for a given amperage and must be sized according to the motor and prop combination. Translation: too much current and they’ll fry. Quadrotors generally use lightweight lithium polymer (LiPo) cells. They’re relatively inexpensive and have good capacity, but aren’t as simple as the rechargeable AA batteries in your remote: overcharging and over-draining them can significantly shorten their life span, and cracked or damaged cells can pose some serious safety risks. As with everything else in quadrotors, there are tradeoffs: higher-capacity and higher-power batteries weigh more and cost more. These are just like the control unit that drove the RC car you had as a kid. Many kits don’t include them, or they just have the receiver — make sure they’re compatible if you don’t buy them as a set. To connect all the above components, a little wiring is necessary. Bullet connectors — metal clips on the ends of wires that enable electrical connections without soldering — are a good choice for connecting the ESCs to the motors. Quick disconnections and wire-rearranging means a lot less cursing when a motor is installed backward. A power distribution board keeps the wiring neat, but enterprising DIYers with decent soldering skills can build a wiring harness that serves the same function. In terms of protection, you’ll want some plastic legs to provide gentle touchdowns when things go smoothly, and a dome to protect the fragile (and expensive) electronics for when they don’t. Like the toast landing butter-side-down on the kitchen floor, quads have the uncanny ability to crash on the side with delicate components. Assembly and calibration vary depending on the parts purchased, but there are some great videos and forums online full of helpful information. If you’re really stuck or need some in-person guidance, check out your local hackerspace to see if someone can give you a hand. Starting small with a micro-quad like the Blade mQX or the gratuitously adorable Walkera Ladybird is advisable. It’s much less painful to watch a sub-$100 aircraft make a crash landing than something expensive that you spent hours building and tuning. There’s plenty of room to grow should you catch the quadrotor bug. And once you get a little experience under your belt, you can take it to the The Air Force Collaboratory. This new collaborative platform aims to harness the power of the crowd to take on some of the world's toughest challenges. People interested in science and technology will have the opportunity to work with top Airmen on search and rescue, quadrotors, and GPS systems. 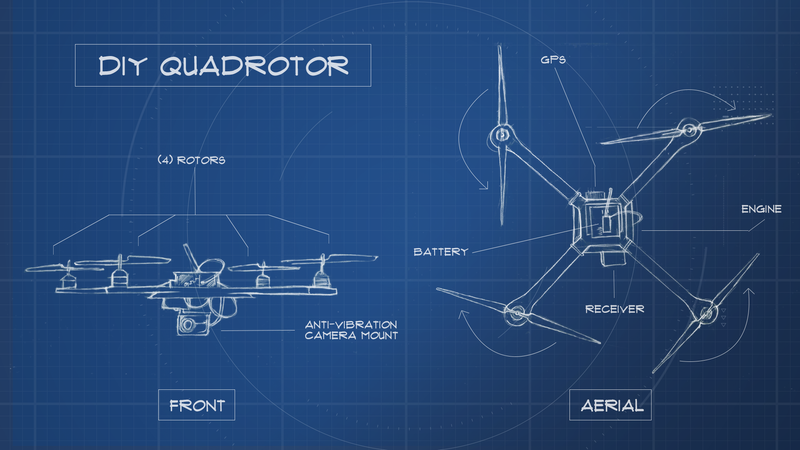 Click here to learn more about quadrotors and how the Air Force wants to use them.